I grew up helping my dad make his “famous” chili for special occasions like Christmas Eve and New Year’s Eve. If there was a holiday party going down you can be sure his chili was the main event (often paired with his “famous” Caesar salad and garlic bread – his 3 staple recipes that we ate time and time again). A love of chili is definitely in my blood and rarely does a winter go by when I don’t make a couple batches of it. Of course, my versions are free of animal products, but I can promise you they are just as tasty as the originals (you can also find my version of Caesar salad in my cookbook, by the way). I have a couple chili recipes on the blog already, but this one is my favourite by far. I see recipes as works in progress; I’m always tweaking and improving the flavour and the method each time I make them. A recipe is never the final word even if it feels that way at the time. Isn’t that what makes cooking fun? I think so. Plus, it gives me a chance to try and improve upon the last batch of photos! This time I served the chili with a homemade vegan sour cream and now I can’t believe that I’ve been eating my chili without it for all this time. It’s like a creamy ribbon of heaven dispersed throughout the bowl, taking a bit of edge off the spices. Where have you been all my life? I’m always asked about recipes that freeze well and chili is definitely one of them to prepare in bulk and freeze. It’s also packed with protein and fibre so you really don’t need to serve it with much else if you don’t have time. Sometimes just a crusty roll or crackers will do. It’s a meal that leaves you feeling satisfied for hours and hours. If you are like us and caught in winter’s wrath yet again this week (nooooooo! ), I hope this dish brings you the comfort it’s brought us during this snow storm. Stay warm! * I recommend finely chopping the celery so it cooks faster. ** Try swapping the raw red pepper for jarred roasted red pepper. It makes the flavour simply out of this world! A few of my go-to jarred or canned bean and tomato products are as follows: For canned beans I buy Eden Organics, for canned diced tomatoes I buy Ontario Natural Food Co-op, and for tomato paste I try to buy it in a glass jar whenever possible (Bioitalia is one brand I use). I try to buy glass jars for tomato sauces and pureés too. Click here for the Cashew Sour Cream recipe. You had me at “sour cream.” Bless you. This is a great and easy meal, I can’t wait to try it! As an update, I made this last night for a potluck and everyone thought it was amazing! The sour cream was a big hit, too! We didn’t have any chili powder and I’m kind of sensitive to heat, so we didn’t add that in, but the rest of the recipe stayed the same. Thanks! You added the jalapeño but omitted the chili powder…? I don’t find the cashew sour cream tastes like cashew if you use raw cashews. Each to their own I guess. I add a little lime juice and salt and it’s perfect for me. What brand of yoghurt is it? The only brand I can find here is loaded with unnecessary ingredients. I’m always looking to see if I can get a hold of something better. Mmm, chili! Definitely sounds good on a cold day like this! I’m definitely making that sour cream. It’s the Mr’s favorite! This is exactly what I need during all this snow! We just got the third big snow storm of the season. Spring cannot come soon enough! I love chili, especially on stormy winter days like today! I love all the heat you have added to this recipe, I have never added a jalapeno to chili (no idea why!) so I’m excited to try it. Even though I’m not vegan, I agree a good chili doesn’t have to have meat. It’s all about the seasonings and toppings. And what a great topping you have here with the vegan sour cream! SO creative! As far as the snow? It’s falling here in Burlington as I type with no signs of stopping. It’s been such a snowy winter! 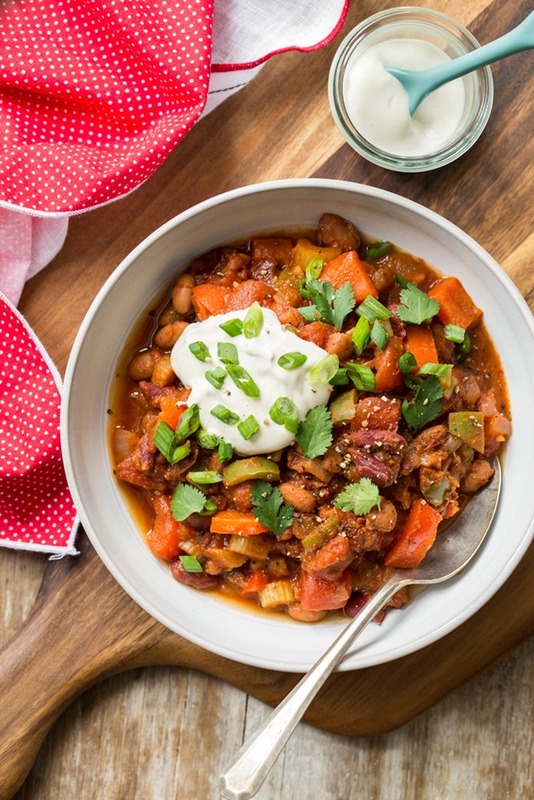 This chili looks so comforting and I really want to try the vegan sour cream. Regular sour cream is one of two reasons I stopped eating a completely vegan diet. It’s just so good! (And greek yogurt is a great substitute but still not vegan). I already tried you chili with chia seeds and LOVED it, so can’t try to make this one :) Your idea of a vegan sour cream is pure genius :D Thank you for such a wonderful and versatile recipe! how long would you say the sour cream stays fresh in the fridge? 3 or 4 days? I’m not positive, but probably 1 week or so. This looks delish! How long can you store the sour cream in the fridge for future use? You are completing my life with that homemade sour cream up there! Yum, I love a good chili! I eat it several times every winter. I’ve added sour cream to cauliflower soup before and it added a wonderful creaminess. I will definitely have to add sour cream to my chili! I LOVE vegan chili. I love the taste and it fills me up..Plus I can tell my meat eating husband that it’s “soup” and he doesn’t even question if there’s meat ;-) I cant wait to try it out! The recipe for the sour cream sounds interesting. But does it have the same flavor of sour cream? I love LOVE vegan sour cream! Ive been craving a baked potato with chili and sour cream lately! All vegan of course! This recipe looks splendid! That sour cream is genius! I can’t wait to try it. You’re so right – chili is perfect for this week! Snow piled down on us again today… ick! I love freezing chili like you mentioned. There’s nothing like pulling a meal out of the freezer in the morning and it being ready for dinner that night. I love your photography skills, they are fantastic! 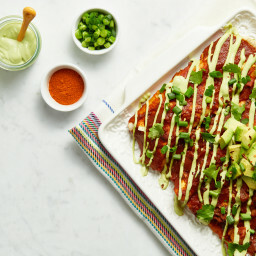 The Chilli looks so good I can’t wait to try it.Your sour cream sounds delish (: …my vegan daughter usually mixes Tofutti (soy product) with lemon juice to make our sour cream (also very good and simple to make) to top our vegan nachos with homemade refried beans! Looks so delicious! The thing I always DISLIKE about chili is that often I find there’s too much sweetness to it when the cook is trying to cut the tomato acidity, but this sounds like the flavour combo would be just right. I was just thinking about how I haven’t made chili in a long time! Yours looks thick and delicious. Thanks! I do not presume to know your politics, but if women’s health care and reproductive rights are at all important to you, Eden is not the company to be supporting. I stopped buying Eden brand many years back because of this. It is so cold here and I can’t think of anything more comforting than a bowl of this chili! Hehe my dad claims to have a ‘famous’ Caesar too! This sounds amazing, especially because of our ridiculous weather today! Thanks for the note about the BPA free canned goods. Lately I’ve been buying my beans raw and cooking them but it’s always nice to have a backup can on hand when you don’t have time! I’m going to look out for the tomato paste too since that’s something I think I’ve only ever seen in a carton! Looks perfect for this weather! I’m definitely a vegan chili fan. Nothing better than something creamy and tangy on top to cut the spice. I usually make some guacamole, but this sour cream looks so good! Can’t wait to give it a go. That’s so comforting and hearty and warm & cozy looking! I’d love a bowl! And way to rock the homemade sour cream! You go! I love veggie chili! 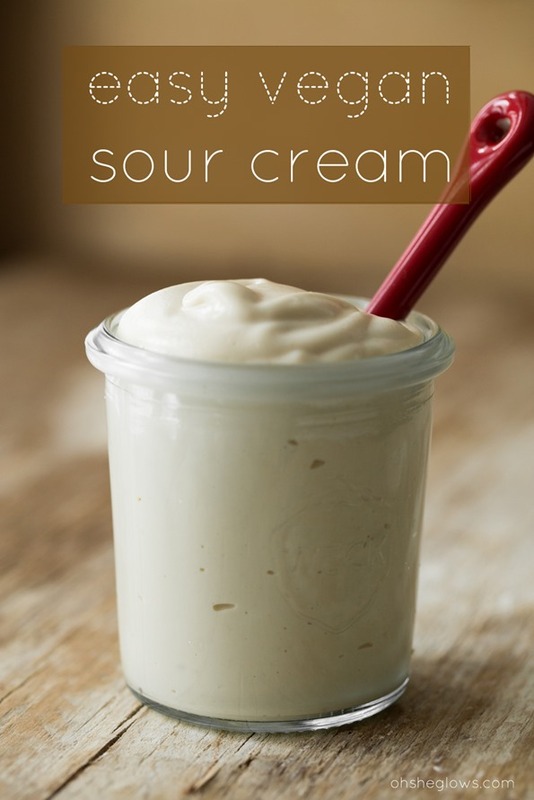 And I’m not a fan of sour cream, so this vegan sour cream recipes does look delicious! Mmmm that chili looks delish! Quick question: how long will the sour cream last if I made a batch using your measurements? This looks wonderful! Chili is one of my favorite winter dinners to come home to after one of my longer running workouts, or even better after my 17+ long runs. It is the perfect post run fuel and has helped my body begin the recovery process many times. I usually use greek yogurt as sour cream due to the high protein content, but I love the idea of using cashews in your homemade sour cream! That sounds incredible! You must have knew that there was an impending snow storm when you posted this ;) What perfect timing for a big bowl of chili! I made the chili and the sour cream tonight for dinner. I added a couple things to the chili (diced mushrooms and a diced sweet potato) which created the need for another can of tomatoes. VERY yummy. I wasn’t sure about the sour cream – when I smelt it (smelled it?) it had that sour smell but when I tried it on its own I could taste all the components. But then I added a lovely dollop to the top of the chili with some green onions and what a miraculous transformation – it tasted just like sour cream. AMAZING!! So because of the extra inclusions we have some left overs… Yay! Can’t wait for lunch tomorrow. Thanks for yet another great recipe! Already shared it with some friends and family. Hi Leigh, I’m so glad you enjoyed it! Thanks for your feedback. I should have mentioned it wasn’t just me who loved your chili and sour cream but everyone in our house loved it. Okay, all 3 of us give it 2 thumbs up and our cat who LOVES the smell of cumin for whatever reason became “kitchen cat” while it was cooking! I made this last night, and was it AWESOME! Thanks for sharing this recipe! I made this last night. I only used one jalapeno, though, and added in some Boca crumbles and corn. It was a little spicy for my liking. but overall, I thought it was great. I’ll definitely be making this again – just with a little less heat. This is a wonderful creamy recipe for vegan sour cream. I have made sweet cream with cashews but not a sour cream for enchiladas or chilies. I pinned it so I will always have the recipe at my fingertips. how long does the vegan sour cream last in refrigerator? Im not positive but I would guess 1 week or so. That looks delicious!! I make a versious on this, but I have never tried to make my own sour cream, can’t wait to try it out for dinner tonight!! Oh wow!! This chili looks fantastic! I’ve recently decided to go vegetarian, so I’ll definitely be using this as it gets colder! Made today for lunch. I added a chipotle pepper and done adobo sauce. Gave if a nice smoky taste. Yum! The sour cream was delish! My mom even enjoyed it in our chili and she is a Dairy Queen! I recently dove into the vegan lifestyle and am sincerely enjoying cooking and tasting all these delicious flavors! Me and my husband just got done eating this and it was awesome! I did leave out the heat so I can’t comment on that. The “sour cream” was amazing stirred into to soup. It seriously tasted like real sour cream mixed in. 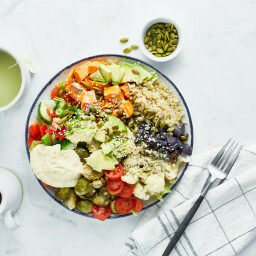 We aren’t vegan either, just trying to eat better so this review is for everyone…..not just eaters “used to” vegan food. This was awesome ! I also pre-ordered the cookbook and can’t wait until March! Have you ever tried making sour cream/yogurt by using water kefir grains. I just soak a cup of cashews overnight, blend them with a bit of water and then just throw in a teaspoon of water kefir grains and a bit of sugar. In about 12 hrs (I live in India) I get a really nice tangy probiotic yogurt. I have read that you can use water kefir grains only with water for them to grow and be strong, so I just discard these grains after making the yogurt. I also use excess grains for bread in place of commercial yeast turns out pretty awesome. This is great! I made it tonight, it was so easy and really delicious. I went easy on the chili and cayenne, but still would be a bit more conservative with it in the future (we had some runny noses). But I love it. The perfect go-to chili recipe. Thanks so much! I made this chili last night. I wanted a quick, simple recipe to make after working all day. I was excited to see a new recipe on your website Angela! However, I was completely blown away by the “Vegan sour cream”. Easy to prepare and tasted even better than Tofutti non-dairy sour cream! Thanks again for another great recipe. I only have a tiny bowl of chili left for lunch today with a teaspoon of the vegan sour cream. I may have to make another batch! Our kids are grown and it is just the two of us so we had lots of leftovers. I froze some for later which I really like doing for no cook days! I used some Tofutti sour cream that I had on hand but I will try your sour cream recipe in the future. I love using cashews for dips and creams. Absolutely love this chili! And that cashew sour cream sound fantastic! This is wonderful! I’m making this now! I’m always looking for a good chill recipe. And thanks for the note about what kind of tomato sauce and pastes you use! 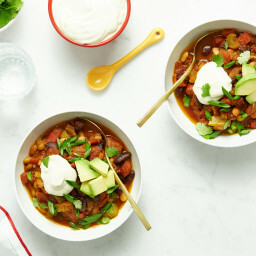 Yum, this is absolutely perfect for our weather today, I never get tired of trying vegan chili recipes. Thanks! This is sooo yummy, like all of your recipes! Made this today! So yummy. First time I’ve had “sour cream” in a very long time. Wow, I can’t believe how similar it tastes to the milk variety! Yours is quickly becoming my go-to recipe blog. My fiancé is not vegan, but I am, and until you posted your tex-mex spaghetti squash recipe, he hated squash. Now he requests it almost every week, and insists I make it for his family when they visit. Thank you for being so wonderful. Beautiful! I love to see all the colors! I try and eat all the vegetable colors every day! I made this chili last night and it was delicious. I increased the amount of jalapenos because I like it hot, and used 1 19oz can of chickpeas and 1 19oz can of black beans instead. I also added 3 large squares of 72% cocoa chocolate and simmered lower for longer. But wow!! So delicious. Thank you for this recipe. Your food always looks so amazing. The photography is gorgeous. Everytime I try to make Chili, it ends up being really meh. I’m not really sure why. Maybe I need to be more careful about measurements? Made this chili tonight to combat a cold that came at me almost overnight. I paired it with some cornbread, and I am as happy as a girl with a cold can be! Made this for dinner tonight paired with a hemp dressing “Caesar” salad and sourdough toast. I added zucchini and corn kernels to the chili. My bf, who vehemtely hates sourcream was practically spooning the cashew cream from the blender into his mouth. He told me this was possibly the best meal I’ve cooked. Ever. I’ve been making veggie chilli for years using veggies ground but this was the first recipe I’ve tried that consisted of all beans and vegetable. Great job! This looks lovely! The vegan sour cream is really cool, great job Angela! I just got around to making this, and OMG the sour cream is great! I never had sour cream on chili (before I went vegan I just topped it with cheese), but if the real thing is only half as good as the cashew sour cream was then I’ve been missing out! Thanks for the awesomeness, now I have to resist the urge to eat all of the sour cream with a spoon. 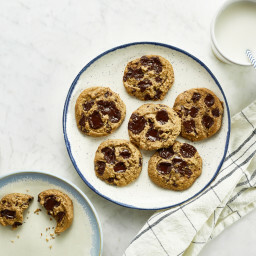 I love this site, and your recipes are delicious! Keep up the good work! I just made this–sautéed the veggies and threw them in with everything else in a crock pot for 3 hours, because I’m lazy like that. Wowee this is good! Now it’s my favorite vegan chili too, thank you! Looks delicious and I didn’t know you could make sour cream out of cashews at home! I made this yesterday and I have to say it’s delicious!! Yesterday I cooked up a veggie Italian sausage, sliced it lengthwise and then topped it with chili, Daiya ‘cheese’ and some spicy mustard. SO. GOOD!!!! that sour cream recipe sounds really intriguing – I’d love to try it. wonder if it would make a good base for vegan tzatziki? just add some cucumber, mint and garlic… could be good! My new favorite take-to-work lunch. It drives everybody else in the office crazy, it smells so good. I have handed out the website address. I made this for dinner tonight. We loved it. I was not expecting it to taste so good. We always rate dinners on a scale of 1 – 10 (10 being out of this world!) I never make anything that gets a rating of under 8 ever again. But this got a 9! It was really delicious. I forgot to soak the nuts so we did not have the “sour cream” with it but I am looking forward to trying that next time. I have tried about 8 of your recipes and decided after making this chili that I just had to have your cookbook. Thank you for the time and effort you have invested to help my family eat more healthy meals. I don’t ever comment on blogs like this but this is SO GOOD i had to say something!! IT WAS AMAZING i am so happy i made it I couldn’t be happier with my first attempt at chili :) thank you!!! I added a few extra sweet colored peppers too, was delicious! I loved the way this chili turned out! Thank you for another great recipe, Angela!! Can’t wait to get your cookbook that I pre-ordered :) I put in one jalapeno and chili sauce instead of hot sauce since I didn’t have any. It was the perfect amount of heat for me. Your recipes never disappoint! I am looking forward to trying this recipe and enjoying it, as I have loved everything else! Hey Katie! Thanks for your kind words…so happy to hear you are enjoying the blog + recipes! I don’t have a Matzo ball soup recipe, but I will have to check them out online sometime and see what I can do. :) Take care! did you ever come up with a recipe? Made the chili for dinner tonight and my god was it good! Here in Kentucky the weather has been morbid so a vegan lifestyle has been hard to acquire to and I was running out of ideas for warm hearty meals that weren’t already pre-made! Love and light to you and your blog. It is a godsend to vegans with no clue where to start when the unpredictable happens! 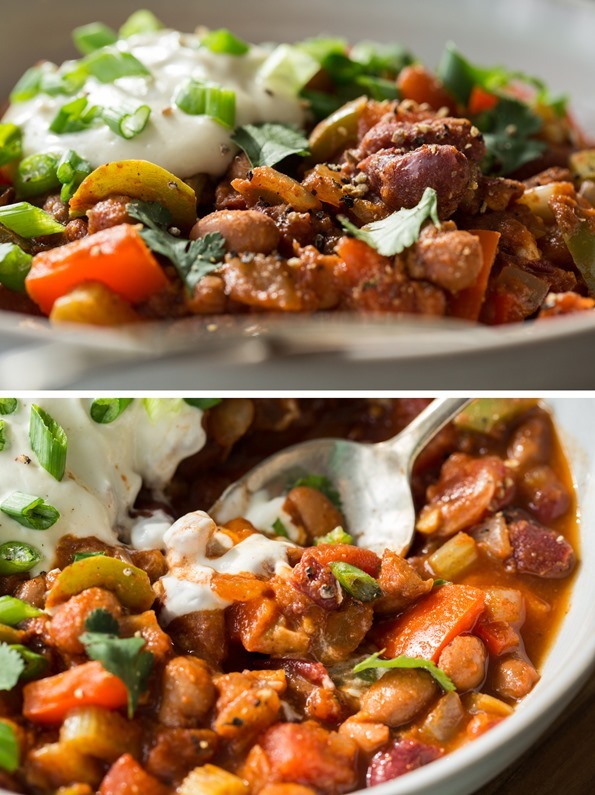 I just made this wonderful chili I had to substitute jalapenos with chipotle chiles. It was delicious – what a great blend of flavors. with the cold day today, this was the perfect ending – thanks so much for sharing!! Best chili I ever had and soooo easy. Thanks for making me look like I could cook! Hi Angela – LOVE your blog/site – I’ve ordered your book :). Question- I made the sour cream but didn’t measure the lemon/vinegar and must have put too much vinegar (never again) how can I mellow out the flavour? I’m out of cashews. Thanks! Aside from adding more cashews, maybe try thinning it with a bit of unsweetened/unflavoured almond milk? I made this last night for dinner for the rest of the week, so I haven’t tried it yet (though I have no doubt that it will be delicious), I wanted to mention that cutting the jalapeno peppers burned by hands for hours and hours – as if I had stuck my entire hand on a hot stove. Maybe I’m the last person in the world to not know of this phenomenon, but I definitely won’t forget for the future. No direct skin when dealing with jalapenos – EV.ER. Mmmmmm… I love chili. I never thought to put celery in it but I bet it’s great. I always add a few teaspoons of cocoa powder and 1/2 a beer to give it depth… don’t know why but it totally works! Hi Angela! I’ve come across your blog several times (usually following links from Pinterest) while researching alternatives to common dairy products for my daughter who has a dairy allergy. I’m always so excited to find recipes for things like vegan sour cream… and it’s always such a disappointment when they’re made with cashews, because I’m allergic to them! Given my history, and that my daughter already has a food allergy, I’m not going to try her with cashews until she’s older. I understand that cashews are a common base for many dairy-alternative recipes, so I’m wondering – is there another nut that I could soak that might yield similar results? Almonds? Macadamia nuts? Or does this really only work with cashews? I’d really appreciate your input, as cashew-based “dairy” recipes are all over the Internet, not just your blog! Oh, and as someone who has been steadily moving towards a more plant-based diet over the past few years, I really appreciate all the great recipes on your blog as well! This chili looks delicious! That’s wonderful! Thanks for letting me know! I will be embarking on making my own dairy-free creams, etc. in short order! If macadamias can be used just as easily, I wonder why more cashew-based recipes don’t specify that other nuts can be used… maybe a taste or price difference? In any event, this is very helpful information to have – thank you again! I would love to make this too, except with have a complete nut allergy in our house. Can this be made with sunflower seeds? I made this last night for dinner & it was wonderful! My husband adored it & kept saying, “Wife. Seriously. This is so good!” And he is a meat eater! I served it with homemade whole grain corn bread. Thanks for making healthy so yummy! I’m slowly going to go vegan and, thus, need to start somewhere. I made this chili tonight and it was delicious. Tastes just like the meat chili I grew up on. All the right spices/seasoning. I cut up avocado as a topping, instead of, the sour cream. So happy to hear this Shelly! I finally made this last night and it is the most amazing vegan chili I’ve had to date! Thank you Angela for being so awesome at what you do! Thanks for the feedback Nicole! SO happy to hear you enjoyed it so much! oh dear!! lol. I would suggest adding more liquid…it sounds like your blender isn’t digging the thick consistency! I made this chilli this evening and it was absolutely amazing! Thank you so much! First of all, I have to say how ecstatic I am that I found your wonderful blog. Its amazing and I am raving all about it since I made the No-bake Double Chocolate Torte for my mothers birthday a few days ago. Out-of-this-world FANTASTIC!!! I used hazelnuts and added 1 tablespoon of ground coffee in the Torte, and the Avocado moose was just as great with the natural sweetness from pure maple syrup. 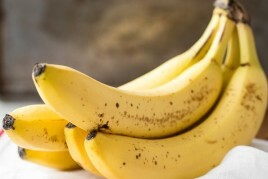 Raw and low glycemic, you cant beat that! I love that you are so creative and innovative, and best of all VEGAN :D You totally rock!!! Wow, great recipe! Delicious, fast, easy to prepare and I know I will have leftovers for lunch for several days. I am enjoying your blog very much- thank you for all the delicious recipes and the lovely photos! Made this tonight. Very pleased wih the results. I was pressed for time so I let the cashews soak only for 2 hours. This resulted in a very fine grain in the sour cream, but equally as delicious. I am not a vegan but I wanted to add something vegan to my diet. This will remain a favorite of mine for years. It’s everything that I love in a chili. I am also a sour cream monster, so this was a nicer, healthier alternative to my severe-amounts-of-sour-cream ways. I’ve just got this simmering on the stove now. I’ve had a quick taste and think this is the best vegan chilli I have made so far. Thank you. Oh and your cookbook just arrived this week. So I will be trying out some of those recipes soon. Think I’ll start with the burgers! So much to choose from and they all sound so delicious! My husband has always loved his mother’s chili, and I have been using her recipe since we were newlyweds several years ago. It is a traditional recipe that uses ground beef. I just tried this recipe and it is on par with any chili I’ve made before, I did not miss the meat at all. My only adjustment was that I added ground clove, because I wanted it to taste as much like my mother in laws as possible. It is wonderful! Tried this last night and it was wonderful. My husband only got a small bowl, saying he wasn’t real hungry. Two bowls later, he said he loved it! I am a new reader on your blog and was tickled to hear about your good news this morning. Love your blog and recipes.Take care. Thank you so much for your recipes! I’ve been looking for ways to cut dairy (especially since I’m lactose intolerant) and that recipe looks like it’ll do just the job. I do have a question for you, though. I have a bunch of allergies and think I’ve come up with ideas for replacements for all except for bell peppers. Do you have a suggestion for a bell pepper substitute for someone with nightshade allergies? Wonderful chili!!!! Very good spice to it, and loved the al dente texture. I did not make the homemade sour cream, but instead topped it with Toffutti Sour Cream, cilantro, and green onions. Served it up with some blue corn tortilla chips. Now I am excited for football season!! I FOUND MY CHILI!!! This was so scrumptious! Thanks again! My son and I have recently changed our diet. I am making the Vegan Chili for the third time. It’s delicious. Thank you! I’m allergic to cashews! Do you think the sour cream recipe would work with almonds? Today I made the sour cream & my daughter made the chili. We doubled the recipe so we would have leftovers after the three boys attacked it. I had my doubts about the sour cream, but was amazed with the dreamy texture and flavor. The chili had a spicy kick to it, but the sour cream cooled it down. We will definitely be making these again! I made this chill tonight – yum! Even my boys loved it! I didn’t have the ingredients for the sour cream..but can’t wait to try it next time! I made this sour cream today because I’m on a 28 day dairy cleanse and I made tacos… I added half jalapeño, cumin, chili powder, garlic, lime and cilantro to the cream then used it as a dressing for shaved Brussels sprouts and carrot slaw to go in the tacos. :) thanks for the recipe! I am just wondering when you make the sour cream if it is a still a little gritty from the cashews? I soaked them for 8 hours and then used a food processor but can’t get it perfectly smooth. Oh my gosh! This was the best chili I have ever eaten, there wasn’t any leftovers. Just had this for tea and loved it. Put a bit too much cayenne in though so blew my head off a little! Looking forward to trying the cashew sour cream next. How long does it last for? Have you ever tried to do with recipe with walnuts? Just curious because I love walnuts. I love your website, book, and recipes! I have a question about the vegan sour cream and most of your cashew cream-based sauces. My husband is severely allergic to cashews (tragic, I know), which makes it impossible for me to make most of these recipes on a regular basis. I’ve tried sunflower seeds as an alternative, but the taste of sunflower is quite strong and often doesn’t work. We made this for dinner tonight, complete with the vegan sour cream and we made some vegan cornbread from another blog to have on the side. It was absolutely beautiful and DELICIOUS! Thank you so much for sharing this wonderful recipe! I am really enjoying all of your recipes in an effort to eat more healthy things. I tried the cashew cream and fear I have done it wrong. It isn’t very crreamy, but rather gritty. Could someone help me figure out what I did wrong? Thank you! Hi Reanna, Some blenders wont get the cashew cream super smooth unfortunately. I use a Vitamix and it works great for sauces. I would suggest adding a bit more liquid and seeing if that helps? I’m making this right now:) Is there a reason you use canned beans? I’m cooking beans and wonder if there is a big difference. My daughter is allergic to cashews. Is it possible to make this with another nut? Say, almonds? Thanks for the chili recipe. Can’t wait to try it out. Made this last night and it was AMAZING! Decided to make this the morning of, which gave me plenty of time to soak the cashews. In the evening I didn’t feel like turning on the oven so I toasted the walnuts in the pan before I sautéed the peppers and onions. The nuts were a beautiful golden colour and sent a wonderful aroma through the kitchen. Served the tacos with Fresh is Best Salsa. Omgosh, so GOOD! My guests devoured them. Thank you for sharing this wonderful recipe. I’m not even a vegetarian and I loved them. oops…in my exuberance, I posted the comment to another recipe. My bad. I was referring to the Ultimate Green Taco Wraps. I just made this the other day, and while it was healthy, good, and filling, it wasn’t great. I think it’s because the cumin and/or the chili powder overpowered a majority of the other flavors. I couldn’t taste any of the subtlety. The cashew “sour cream” was so good when I sampled it alone! I was shocked how tasty it was! But I couldn’t taste it at all with the chili. I think next time I’ll use half of those two spices and see if it helps. I agree about the cumin. It was a cumin punch to the face. I think maybe 1/4 of what it calls for and I might have been able to taste the rest of the ingredients. Lesson learned though. Wouldn’t have known without trying it. Just made this in preparation for a get-together I’m having tomorrow, and the spoonful I tasted was great! I used one spicy pepper, though, and boy – what a kick! Note: The chili didn’t thicken as much as I wanted it to though… even after an hour on the stove, so I added some corn starch. Im in the process of cooking this right now sour cream and all! Plus I found a vegan cornbread recipe. I had a question though. Can I just boil the cashews for 10 min prior to making the sour cream? I did a vegan fettuccine sauce the other night that said it was ok to boil the cashews if u didnt leave them im water over night. Thank you! Oh my Gosh, I made the sour cream today, and it’s a killer. Better than the real one! Thank you, Angela! Hi Angela! Made this last night and I have to say I was SO impressed. It is a chilli deserving of being anyone’s favourite! I made it pretty much the same but threw in a couple of extra shakes cumin, cayenne and chilli and omitted hot sauce. Mouthwateringly Flavoursome! Not at all bland which seems to sometimes happen to my curries/chillis. Will remember to garnish next time instead of eating from the pot. I just made the chili and love it. Thanks for the recipe. I added meatless beef crumbles and placed the chile on top of spaghetti squash. Wow! Do you ever use morning star products or similar brands? This sour cream is delicious!!! I’m newly vegan, and your website has been amazing to help with the transition (from vegetarian). I’ve made about 10 of your recipes in 2 weeks. I have made this sour cream at least 3 times, and it’s went on your lentil walnut tacos and holiday soup. Also, congratulations on the birth of Adriana!! She’s beautiful! I’m a first time mommy myself. My son, Colt, is 3 1/2 months old. Oooh, I love chilli! But since going vegan earlier this year I haven’t had sour cream and I’ve missed it. Tried blending up my soaked cashews this morning, but I can’t seem to get it super smooth. :( any tips? So I made the sour cream and it is yummy, but still seems powdery and nutty/sweet. I soaked the cashews for about 20 hours in the fridge. Was that too long? Maybe this would be good as a white bean sour cream? any suggestions? OMG!!! THIS IS ABSOLUTELY AMAZING. Seriously, the chili is so great and makes the absolute best left overs :) and that sour cream?? UNREAL! I have made this for both vegans and non-vegans and everyone cannot get enough. My grandpa is even using the sour cream in place of mayo!! What a great recipe-you are amazing! Just ordered the cookbook and I cannot wait!!! Thanks so much for this recipe. I made it over the weekend (although I tamed the spices right down!!) I think it has to be the BEST chilli I have ever made and, to top it off (excuse the pun), the sour cream recipe is absolutely wonderful! Unfortunately I couldn’t get the sour cream mixture smooth, but next time I will double the recipe and see if that helps … if it doesn’t well, what the heck, I still have a wonderful mixture to freeze for next time. Oh yum! Made this for dinner tonight and it was so good! Two out of three kids (the third one is the pickiest kid ever) enjoyed it too. My husby and I both felt the “sour cream” was much tastier than the real thing. Definitely will be making again! I am LOVING your blog!! Thank you!! your recipes are amazing and delicious! I am grateful for you and for my sister in law for telling me about your website :) My husband is allergic to cashews, so all these amazing vegan recipes that use cashews to make a creamy base are out for us. Is there anything I can substitute? Hi, Since I had all ingredients at hand, I just decided to give it a try. The result: the taste is far away from yoghurt (or sour cream, for that matter), but my little boy loved it, ate two large portions of it combined with granola, didn’t complain that it tasted different than his oh so beloved yoghurt… So I have found myself an easy vegan non-soy yoghurt replacement, thanks! About how many cups does one recipe yield? I made this today. Very Good. It’s my lunch for the week. I know this is an old recipe. I just wanted to say I made this recipe with sour cream and all for myself and my dad. It went down a treat with both of us. Thank you so much. Not only did it do us for dinner for 3 days but my dad who is a self proclaimed nut hater loved the sour cream. Admittedly, I didn’t tell him it was made from nuts. I am a virgin vegan ahving been veggie for17 years and your recipes are a godsend. can I ask how long can you keep vegan sour cream? I’m not technically vegan, but I have gradually reduced the amount of dairy and meat intake I consume on a weekly basis. I prefer to not cook with either most of the time. But, I love comfort foods, of course! I plan to cook this tonight and have my cashews soaking now. I was wondering if this could be done in the crockpot? If so, would I still saute the onions and garlic? this recipe is just delicious! I have never made one of your recipes that i did not enjoy! You can even add some organic ground beef for those not true vegans and this recipe is just great! Easy and delicious! thanks! We had our first coldish day yesterday after months and months (and months) of heat so I celebrated by making your chili! First I need to say: OH MY!!!! This is THE best chili I’ve ever tasted! My husband, who used to make the chili (with meat) was shocked it was so good and had a second serving! That, my dear, is a real compliment because he is hard to please when it comes to plant-based meals! Thank you so much! I made your sour cream recipe also (this is the 2nd time) but all I could taste was cashews. I added more apple cider vinegar and lots more lemon juice, but it never got tangy like I was hoping for (and the cashew flavor remained strong). When I tasted it, I remembered having the same problem the 1st time. Do you or any of your many followers have any suggestions? I also made your lentil & walnut meat wraps last week. Once again, they didn’t disappoint! I had to make it with toasted sunflower seeds as you suggested, because what little bit of walnuts I had weren’t good anymore ;-(. But your suggestion of sunflower seeds was magic and it gave the “meat” an excellent flavor when combined with the lentils, thanks for rescuing our dinner! I LOVE that your recipes are full of spices / herbs / flavor! So many people are afraid to use them and I find that very sad. My Mother didn’t use very many, but she did use them. Since becoming plant-based, they have become more important. Thank you for all your luscious recipes! Can you make a this by adding all the ingredients in a slow cooker? Holy Mother! This was AMAZING. Also, this is the first cream recipe my hubby liked, that I have made. We paired this with cornbread muffins. Thanks for a great recipe! I’ve got this on my radar to make tonight! I’m still searching for a vegan sour cream that my parents will enjoy, so I’m hoping this will be it. :) And of course we love chili in the QV household! Thanks for sharing this recipe. Does this dish freeze well? Would like to add it to the menu for an upcoming party. I just wanted to say that I made this last weekend and it pleased 2 self proclaimed “Meat-a-tarians” (my hubs and my brother in law). My sister also said “you almost can’t tell there’s no meat”. It was deeeeclicious!! Thanks for the great recipe! So amazing! I added a little of the “taco meat” from the lettuce wraps it was delicious!!!! Heading to the grocery store to buy the ingredients :) Can´t wait for dinner tomorrow! I was wondering if anyone has done this in a crockpot? I’m thinking of making it tomorrow and would love to throw it all in and let it cook. #3 was one of the first vegan recipes ever made!! I am soooo happy it is one of the most popular because it is delicious!! My hubby loves it, which came a s a total surprise!! Happy New Year Angela! This recipe is very close to one I’ve come up with on my own over the years and love but it has a few nice additions I will try. I have found that adding chick peas in addition to the beans in this recipe adds a nice flavor. Just made this recipe. I am so pleased. Turned out great and is delicious! It’s so tasty, especially on a cool night. I didn’t use as much salt, I probably used 3/4 of what they suggested to use. I replaced the pinto beans for chick peas ( maybe it’s the same thing) I’m not sure. I added a dash more lemon to the sour cream as well. When I ate the chilli, I mix the sour cream completely into the chili and it tastes amazing. Great recipe! Is this recipe easily doubled? Should I change anything when doubling it? Thanks!! 5 Stars! the best meal of the year so far for me. Thank you. I ate double portions – its that good. This is such an awesome vegan chili, it beats all my previous recipes…thank you! I had another recipe with quinoa that gave sort of a minced meat texture. I’ll try to add that next time. This makes for the best freezer meal ever, only problem is I won’t cook anything else if I know I already have this available!! Love it!! This recipe was a hit! I made it tonight for the National Champion game. Super easy and delicious. We like a little kick so left in the jalapeno peppers which worked perfectly. Thanks again for all the amazing recipes! Just made this this evening, and it was FANTASTIC! Added a dash of Worcestershire sauce too. Great recipe! This was an easy and perfect winter meal. I made this on Wednesday and even took in leftovers to share with some coworkers and it was a hit. I thought I was going to make my own pinto beans so when I did my shopping on the weekend, I didn’t pick up a can. I should have known better-never got around to crocking the beans so I wound up using a can of white cannellini beans place of pinto beans, but still came out fantastic. I think with the cashew cream next time I would add less salt & add a bit more sour-maybe extra lemon or vinegar, but in the chili it just added creaminess so I was happy that to have it. As a stand alone sour cream, I would have needed adjustments. Can we give this chili 6 stars instead of 5? This was just delicious! I make one chili in my house, and only one – a sweet potato chili that my husband, friends, and I go crazy for. But, I tried this anyway, and I loved it. It has the right combonation of beans, veggies, and spices. I put it in the crock pot in the morning and just let it cook all day. I didn’t try the sour cream yet, but that is next! Making it again this weekend for a birthday game night! Can’t wait to share with friends! Thanks! Can the cashews be replaced by peanuts or something else? I’m allergic to all nuts but peanuts..
Another delicious recipe. We had this tonight with the homemade sour cream and it was wonderful! The sour cream is genius! So delicious – my husband and I could not believe it tasted like sour cream! It was perfect with the chili and not to be overlooked! Thank you again for another delicious recipe! About how many calories are in 1 bowl of this without the sour cream? Angela this is the best chili i have ever had! Thank you! I followed it exactly and it was perfect! I’m not a big fan of caned beans and wanted to use dried ones. Then I was struggling to find the perfect soaking method when I came across this attached article. What are your thoughts? Super interesting article! Thanks for sharing. I’ve always been in the soaking camp and would’ve never thought that not soaking might lead to more flavour. Will have to test it out sometime. Are you sure you use raw cashewnuts?? Raw cashewnuts are toxic . I won a Chili Cook off at work because of it! Imagine everyone’s surprise when I told them that it was 100% vegan and that there was no meat in it! The trophy is inscribed “Master of Meat, Lord of the Beans”. My colleague’s joked that I had such mastery over meat, I didn’t even need it. I think people will think twice before poo-pooing vegan food! mine came out soooooo good! very easy recipe to follow. i didn’t make the sour cream myself, i used tofutti but i’m sure home made is better. i will definitely go for it next time! Do you ever freeze soups in a freezer safe bag? What about a mason jar? I am trying to freeze up individual servings for on the go! OH MY GOD! I don’t even like sour cream, but my boyfriend loves it and now that we have turn to a vegan lifestyle I thought this would be a great recipe to try for our meatless taco salad. I was the one licking the bowl and he loves it! We are both so glad to find this recipe. delicious! 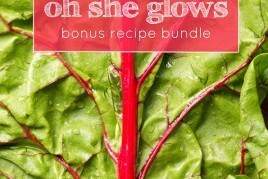 Thank you, ohsheglows, Ohmyguests will glow. -the Green Tea Lime Pie Bowl. All a HUGE SUCCESS!! my baby(33 y.o.) claims the “sour cream” tastes amazingly like ricotta. This is just amazing recipe, I love it so much :). I made it todayfor lunch and my dad who is not vegetarian nor vegan loved it too :). This is the BEST veggie chili I have ever had. The problem is the veggie burgers are all gluten and egg whites but they add a depth of flavor that is amazing. I think these could be substituted with another burger and it would still be good. Anyway, this is a great recipe!!!! 1. Heat the olive oil in a large pot over medium heat. Stir in the onion, and season with bay leaves, cumin, oregano, and salt. Cook and stir until onion is tender, then mix in the celery, bell peppers, jalapeno peppers, garlic, and green chile peppers. When vegetables are heated through, mix in the vegetarian burger crumbles. Reduce heat to low, cover pot, and simmer 5 minutes. 2. Mix the tomatoes into the pot. Season chili with chili powder and pepper. Stir in the kidney beans and black beans. Bring to a boil, reduce heat to low, and simmer 45 minutes. Stir in the corn if you want to add it, and continue cooking 5 minutes before serving. 3. Serve with sour cream, shredded cheddar, and chopped scallions!!! what is the calorie intake per serving, any ideas? I confess that I’m not vegan (or even vegetarian); I’m still an omnivore. I’m not even sure how I stumbled across the recipe but it intrigued me. Made a batch in my slow cooker for my girlfriend. Wow… absolutely delicious..and hearty. I was honestly surprised at how the vegan sour cream actually tasted like sour cream.. a lot. I usually judge vegetarian “main” dishes on a scale from “bland” to “I could really tolerate this if I had to”, but I will be coming back for this one regularly. I may even prefer this to my meat based chili. The only addition I made was a cup of Quinoa. Please feel free to reply if anyone has some links (if you can) to really good hearty vegan dishes like this, you might even get a convert. Made this for the first time. Wonderful, hearty chili. It always works as spaghetti sauce with a slight difference in taste, but still delicious. Both the chilli and the sour cream turned out amazing! I made them for a party of half veggies and half carnivores and they were a favourite of everybody’s. Your blog is great, thanks for the inspiration to sit down and take the time to cook something! Made this today, I’m not much of a cook but when I was done and tasted this I felt like a CULINARY GENIUS. It was so comforting and it tasted fantastic. It was delicious, and was easy enough for a newb like myself, but managed to skyrocket my self esteem. I love this sour cream recipe and make it regularly, but I accidentally made far more than I needed to recently. Do you know how long it’ll last in the fridge? Thank you so much for your vegan recipes. I went vegan almost a year ago and this has helped quite a lot. Thanks for the recipe. We cant have chili unless we have cornbread with it. Thank you Angela for the great vegan sour cream recipe. Your recipe was the 3rd one I tried. One was labor intense and involved cooking and a thickening agent, one was easy but was made with tofu and tasted like it, and then there was your recipe. I will look no further. I find it to be deliciously satisfying. Thank you so much! I just made this chili for the second time, and again it was the best chili I’ve made, or actually eaten. It was so flavorful, that my met eating husband said he didn’t miss the meat and was really happy with the meal as well. The Vegan sour cream was the perfect accompaniment to the chili. I am not usually one to comment on recipes, but this one deserves some kudos. Both the chili and the “sour cream” are wonderful!! 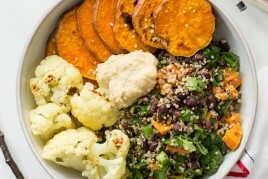 I just started eating vegan a few months ago and this is my favorite recipe so far. Delicious! Thank You!! I just made this the other day and it was delicious. But mine turned out more like tomato soup than chili. I used 2 cups fresh diced tomatoes + 1 cup water instead of canned diced tomatoes. Could this be the reason why? How do I get it to thicken? Do you have a nut free version for vegan sour cream? The chili was perfect! I’m not 100% vegan so I did use organic sour cream, and one of my beans was an organic ranchero (pinto in chili-flavored sauce), which I used rather than rinsing. I will make the vegan sour cream in the future though as I move more in that direction. SO looking forward to the arrival of your cookbook, which I ordered the other day. I really want to try the sour cream, however, for medical reasons I can’t have citrus. That means no lemon juice. Can you suggest an alternative? I can have lemon zest, or lemon extract, just not the juice. Thanks! Could you please tell me if you have a smaller recipe for the Homemade Vegan Sour Cream (cashews) as it doesn’t last long in the fridge and there are only two of us? Would appreciate it greatly. I made this chili and loved it! I had some left over and used in in place of the chunky marinara sauce for your ‘life affirming warm nacho dip’ from the book and it was an excellent substitution! I am going to make a huge batch and freeze! Thanks so much for your site! This chili was jam packed with lots of spicy, well balanced flavor. I added some chipotles en adobo sauce, which elevated the smokiness. It is very easy to make and goes well with some brown rice. Hi, your recipes look wonderful! However, I notice that you use lots of raw cashews, like many vegan cooks/chefs. Since they’re closely related to poison ivy and can cause a horrific internal rash when eaten raw by people (like me) who are sensitive to poison ivy, why don’t you use roasted cashews? (which don’t have the same danger as raw.) Why specific raw — does it make that much difference? This is the best vegetable chili I’ve had. Very satisfying. A word of warning that it has quite a kick between the jalapenos and cayenne. We all liked that, but if you’re not into spicy food then you may want to forgo the cayenne and halve the jalapeno amount. I forgot to put in broth and it was still delicious, so if you prefer a thicker chili you may consider doing the same and saving a few bucks. I doubled the recipe and it served four with leftovers for two lunches. Paired with Oh She Glows vegan caesar salad. First of all, your blog is one of my favorite vegan recipe blogs! I just made this chili this morning. It is TO DIE FOR! It is seriously the best chili I have ever had hands down. *For anyone searching online for the perfect chili recipe, you can end your search now :) . I did a couple substitutions. In addition to the kidney and pinto beans, I added black beans. I poured a bit more vegetable broth to maintain the consistency. I did not add the hot sauce because I felt it was spicy enough as is (I am feeding it to kids as well). The hot sauce could always be added to individual portions. I also added chives as a garnish. This will definitely be my go to chili from now on. Thank you! Unfortunately, the founder of Eden Organics uses his money to actively fight against women’s rights and bodily autonomy. I buy different beans. I love this chili. Do you know the nutritional content per serving. It says “refined sugar free”. Could you tell me which foods in this have natural sugar as such. I’m struggling to keep my sugars under control. I usually eat one cup of this at a time without the sour cream. I guess I’m looking to see the nutritional value and calorie content in one cup. Thank you so much for this recipe. I make it and freeze it into one cup portions. I made both the chili and the sour cream. Twice. In two weeks. Truly the best chili I’ve ever had. The kick from the chili powder, cayenne, jalapeños and hot sauce (I used siracha) is robust and full of flavor, not just heat. Also, this recipe was really quick and easy for this kitchen rookie to take on. Thank you for sharing, Angela. My husband and I just made this for dinner tonight-it was so awesome. We served it over baked potatoes. Usually chili recipes turn out kinda blah for me, but this one is a keeper for sure! Thanks for all you do! Hi Sascha, I’m so glad the recipe was a hit! It’s definitely a fav of mine (probably obvious from the title, haha). Thank YOU for the great comment! I just finished eating this and had to tell you this got two thumbs up from my family! I was skeptical about the “sour cream” and was pleasantly surprised. I actually had my husband taste it (without a clue what it was) and his comment was “mm..sour cream like”. That’s a win in my book. I look forward to trying more of your recipes! Not sure of the exact recipe he ended up using but he got second place and his was the only one completely finished at the end of it (so I’d say that’s a win lol) :) I will have to ask him what he ended up doing! Excellent chili recipe, thank you! What makes this chili so delicious?! I omitted the bell pepper and added a sweet potato because that’s how things worked out in the produce department. Definitely going to be a go-to. Thank you so much! This recipe is amazing! It’s healthy, hearty and full of flavor. Would definitely recommend it to anyone! This chili is fantastic, and it always makes me feel so much better whether I am sick or just cold! However, when I first made it, I made a critical mistake that I would like to warn everyone else about so they do not suffer like I did…. WEAR GLOVES OR A PLASTIC BAG around your hands when you are handling the jalapeños! I didn’t and soon after, my nose and my hands began to burn. I am vegan so it really was awful… but my mom had me stick my nose in cow milk that she had been drinking. Surprisingly it worked like a charm and my nose stopped burning after 5 minutes of holding it. Even though I washed my hands thoroughly, they burned so bad! I tried all kinds of home remedies but nothing worked. Heres a time line: I handled the jalapeños at 7pm and washed my hands thoroughly immediately after, at 8pm my nose started burning and I applied the milk and it stopped burning, by 10pm my hands started burning and they did not stop burning until midnight no matter what weird home remedies I tried! I could not sleep! So the moral of the story is be very very careful, and I would recommend wearing gloves! <3 delicious recipe though! I don’t often leave comments although I had to say this has been the nicest chili recipe I have ever tried and my fav oh she glows recipe so far. I am cooking up a big batch weekly and freezing portions. Thank you I love it. This is the first time I’ve made one of your recipes. I LOVED this chili! I have tried several vegan/vegetarian chills in this past, and this one had a fantastic, spicy flavor that satisfied. It was also pretty quick to prepare! I am excited to try more of your recipes in the future. I’m so happy to hear the recipe was a hit, Renee! It’s a fave around here too. Do you know what you want to try next? Whatever it is, happy cooking! I wish this had the nutrition facts.. I never thought chili could taste so good and healthy, I kind of change a few added ingredients I used whole organic tomatoes with other pot luck healthy ingredients. I’m so glad to hear the recipe’s a hit, Dolly! The second recipe I have done of yours and wow! Perfectly balanced and easy to make. I am slowly converting to vegan and you would never miss meat eating this and beans keep my nice and full (which are also easy to swap depending on what needs using up in the cupboards) Second batch this week made up tonight because I can’t get enough. I recommend the 7 vegetable and “cheese” soup as well. I tried this chili without the cashew sour cream, since cashews are expensive where I live, but despite that, this chili tasted fantastic! I made the a 3x larger batch of the recipe and I’ve gobbled down so many bowls just today of this healthy, hearty stew I’m worrying I’ll get fat from it. This is a very affordable dish to make, too. It costed around $14.50 CAD to make, and estimating extra for the ingredients I had about home, no more than $23 CAD for a 3 gallons of chili. OmG thanks so much for a delicious recipe. I made this for our first vegan dinner and it was a hit. The sour cream is amazing. I couldn’t believe it smelled and tasted just like sour cream only richer and creamier. This will be a staple! Hi Angela, I wonder if you can answer a question for me please? I have made many of your fab recipes and own your cookbook. Often you state 2 tablespoons of chilli powder in your recipes. I live in England and such a quantity would make the food inedible! This is no problem as I just adjust accordingly. I wonder if your chilli powder is much milder than ours or something totally different? Hi Shirl, You’re right; there’s definitely a difference between the products we’re each respectively talking about. In North America, chili powder typically refers to the blend of spices, usually cayenne, cumin, garlic powder, paprika, and oregano, traditionally used to season chili—as in, the dish. Chili-as-in-the-dish powder has got some kick to it (more or less, depending on the blend), but it isn’t hot; it’s much milder than chili powder–that is, chili-as-in-the-pepper powder (or sometimes chile powder, with an e, or what I refer to as “cayenne powder or cayenne pepper”) that consists only of pure, ground dried chili peppers. The latter is what I suspect you may be more used to having in your kitchen (as many of my readers in other countries possibly are, too! ), and it packs a lot more heat. So yes, I can imagine 2 tablespoons of chili (pepper) powder would be quite a lot! I would recommend making a chili powder blend at home—there are a ton of quick and easy recipes online! Thank you so much for taking the time to reply Angela. Now I understand! Here chilli powder and cayenne pepper are different, but both very hot. So I need to make some of your’chilli powder, which sounds tasty. Think this recipe will be even tastier with it ? Thank YOU for the great question, Shirl! :) So glad I could help. I just love this recipe! Delicious! I’ve made this twice, 2nd time was better! I added a habanero to make it more spicy and it worked out so well. I was less worried about exact measurements although I did follow them I wasn’t as fixated on getting the exact amount as I was the first time. Thanks so much for such a delicious and quick recipe. PS: Didn’t make the sour cream, for some reason working with cashews always seems like a lot of work for me! I love the sound of this recipe but I’m having my kitchen renovated right now and have no stove! Can I throw everything into my slow cooker? Hi Sue, I haven’t tried it myself, but I can’t see why not! If you give a try, please let us know how it goes. :) Good luck with those renos! Hi Angela! This looks so delish. We are having friends and their little girls over for pumpkin decorating this weekend and I’m planning to make this chili and sour cream. I’m curious about the level of spicy hot to this dish? On a scale of 1-5 with 5 being the hottest? We are Arizona people and used to some heat in our dishes, but I know little palettes won’t be up for much more than say a 1-2 level of heat… THANK YOU! Didn’t make the sour cream, but the chili was fantastic. We will make it again! Thanks for this miracle! My husband is a sour cream junkie so he takes anything if it comes with sour cream, but if it comes with chili then it’s close to heaven. Haha, glad it was a hit!! Just made this for dinner and it was amazing. Made the cashew cream too!! Doubled the recipe and it came out perfect. Best vegan chili eat! It’s great to hear you enjoyed it, Eleen! This was delicious! I tweaked the recipe a little bit since my family isn’t the greatest fan of cumin or loads spice but it still ended up great over a bed of basmati rice. This is definitely going to be something I’ll remake throughout this upcoming Canadian winter. This chili was fantastic, especially with the vegan sour cream! I made this in my crock pot. I just added all the ingredients in and set it for 8 hours on low. I LOVED it, and so did my non-vegan husband! The sour cream didn’t taste too cashew-like to me. It was perfect and added a great creaminess to the chili. Thank you so much for another amazing recipe!! I’m so glad the recipe was a hit, Megan! And it’s great to know it worked out well for you in the crock pot, too. :) Thanks so much for the feedback! 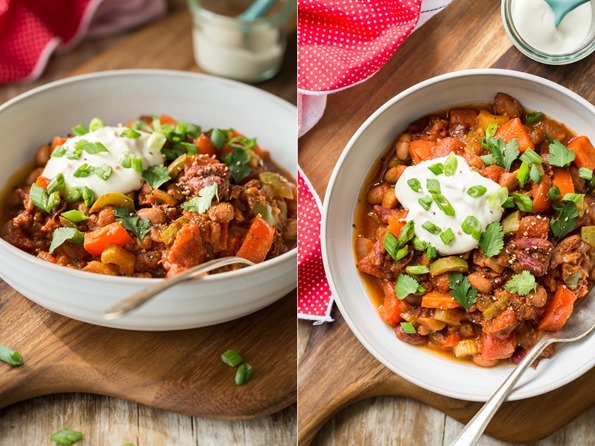 I absolutely love this chili – it has become my go to! I haven’t tried the cashew sour cream, but I do top it with Kite Hill cream occasionally (that stuff is amazing!). 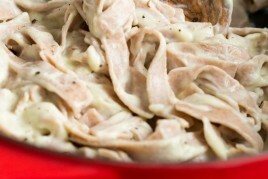 I can’t wait to try to sour cream (and the great crock pot idea someone mentioned!). Thank you for such great recipe!! Can I replace the tomatoes with something else? Thanks! I had this at a friend’s house and it was amazing! I asked her for the recipe and was happy to see it was from Oh She Glows. I made it for a game night recently with the cashew sour cream and several of my non-vegan friends tried it and loved it. They all left with the recipe for the chili and the sour cream! I make the sour cream consistently now and always have to share it with my 25-year-old daughter. It is fabulous. This is truly the best tasting vegan chili I have had; if you are omnivore (which I used to be), you really won’t miss the meat. Also, it’s not as hot as you would think reading the recipe (although I did not add the hot sauce, but did use the jalapeños and cayenne pepper). All around great! Thanks so much for the glowing comment, Leslee. It’s wonderful to hear this recipe was such a hit with everyone! I’ve got a huge smile on my face. Love your cookbooks. Have made ’tis chilli several times and everyone loves it but it isn’t in your cookbooks is it or did I completely miss it? I just tried this recipe last night and I love it. I like my chili kinda chunky also and I could’ve added some water to have it a bit soupy, other than that, amazing recipe. Thank you! Yum! I just made this last night exactly as written and it was delicious! I did add some Beyond Meat crumbles and it honestly tasted just like it was a ground beef chili- flavor country! I’ll definitely be making this again! This chili was amazing! I made it for my son who is vegan for Super Bowl Sunday this year. I loved it as well! I made the chili and vegan sour cream tonight for my the first meal that I cooked for a man that I have recently started dating. He went back for seconds! I loved both. I had a chili classic recipe….it has now been replaced with your! delish! Love all of your recipes! So thought I would try this one today… I accidentally added the jalapeño seeds and it is HOT! Anything else I can add to combat the spiciness? Thanks so much! Hey Kristen, Oh no! Those little seeds pack some punch. I would suggest adding some vegan sour cream on top to mellow the spice, or you can try diluting the chili with some veggie broth…or even a small amount of sweetener? Let me know if you try anything out! I loved the chili. It was to spicy for my wife. I think my chili powder is spicy. I served it with roasted potatoes and the cashew sour cream. Going back for seconds. Made this last night exactly as instructed and it was perfect. Delicious and easy. Didn’t miss the meat at all. Added bonus – leftovers for lunch. I imagine it’s just as tasty cold. Thanks for giving us hope that we can eat healthy without sacrificing flavor. Hello! I’m just wondering if I don’t have time to make my own vegetable stock what could i use instead ? I try to avoid the store bought ones as well . I’m afraid they are full of sodium. Could I use just water and extra spices? Hey Jen, Thanks for your kind words! I use low-sodium vegetable broth (store-bought) typically. Maybe that is an option for you? I like it because you can control your own salt. Hi Angela! Long time reader and recent (past 3 months) vegan! I’ve been plotting to go plant based and finally got my husband on board, which made the transition much easier. I wanted to let you know that I have had great success in winning my husband over on this diet, specifically with your recipes! I’ve tried some others that I personally enjoyed, but he did not. I plan to start making so many more of your recipes now! The Golden Dal was a huge hit and I made this chili this week. I kid you not, he said that this chili was the best chili I had ever made, including my mom’s ground beef chili!! I was ecstatic! Thank you so much for doing what you do! This is the best chili I’ve ever had! I definitely recommend using with the roasted red peppers as noted. I add the vegan sour cream and green onions on top. Soooo good!! We’re making another batch tonight. I made this for my partner who is an avid meat and dairy lover and he absolutely gobbled it up and went back for more! The sour cream is sooooo yummy and easy! I added mushrooms, carrots, potatoes, maple syrup, and more beans…hands down one of the best recipes! Hey Brianne, That’s great it was such a hit! I love your tweaks too. Hello, I love your recipes! So I am looking for a good hearty chili that is on the sweet side but still adds the heat. It seems like the tomato paste will balance out the chili powder flavor. Should any more sugar be added to balance the taste? Also can I add one more can of rinsed dark red kidney beans without it totally changing the flavor? Hey Dorsey, You can probably tweak the chili to your taste…it’s pretty versatile! Yes the tomato paste does a great job of balancing the spices. You can try adding a bit more and a bit of sugar if you want it sweeter. I also think you can add more beans…it’ll just be thicker. Hey Kimberley, Thanks for letting me know it was a hit…so happy to hear that! Last time I tried a recipe it was supposedly “Award Winning.” I don’t know what kind of award it won but I think it had something to do with a school cafeteria. It was awful and a little expensive to make. This recipe however was very good and versatile. I didn’t follow the recipe exactly and made it too hot but a little bit of honey and some lime juice fixed that. I will make it again for sure.. Thank you for sharing..
Hey Terry, I’m so happy to hear this chili was a hit (and good call on fixing the heat with a bit of honey and lime!). Hands down, BEST chili recipe I have ever made! I make this for all my non vegan friends and they all ask for the recipe! I have substituted the beans for Beyond Beef Feisty Crumbles because my son is allergic to beans, of all things! And that works beautifully as well! He is out of the house now so I am back to beans and my husband and I just crave this chili! Thank you for the recipe!! LOVE!! Hey Kathy, I’m so happy you love it so much! And that you were able to swap out the beans for the crumbles for your son. Such a good idea. Oh good call on swapping real tomatoes :) So glad that works well for you and that you enjoy the recipe so much! My wife and I made a double batch of this Chili and 4 times the batch on your Cashew sour cream. We invited all our non-vegan friends over for a football game. We also made a side of ground beef just in case if they wanted to add it to their serving. Everyone loved it and most of the meat was not used! This is now in my must have list for making chili. Thank you so much! Hey Scott, So glad to hear it was a big hit! Good call on the double batch and 4x cashew sour cream :) I like the way you think! Made this tonight, including the cashew sour cream. It was amazing!! We also sprinkled on some broken corn chips, which added the perfect crunch. Will definitely make again. So happy to hear that, Brooke! This is delicious! The perfect amount of spice and freshness!! This is a staple recipe at my family’s home. This is my all time favorite chili recipe, I can’t count how many times I’ve made it. My “meatatarian” husband loves it, and it freezes so well. Thank you Angela! Hey Joanna, I’m so happy you both love it so much! While I don’t have an instapot, I’ve been thinking of getting one. I’ll be sure to do some updates if I try out any of my recipes. But I’d love to hear if anyone has tried it too! You may be able to look online for vegetarian chili instapot recipes for ideas on how to cook it? Love this recipe!! I add a can of corn and serve it over Fritos. Thanks!! Excellent vegan chili. I up the umami by adding 1 tablespoon dark cocoa powder (unsweetened, obviously), and I substitute beer for the stock. Any beer will do, including gluten free, or near-beer. This tends to pacify the meat-eaters. If you have small persons, or those who don’t like heat, halve the chili powder to start (some are very hotter) and served the diced jalapeños as a topping. I leave out the tomato paste, and thicken by smushing the beans with a potato-masher near the end. Another traditional thickener is corn meal–add one tablespoon and then wait, though, because it takes a few minutes to thicken. Hey Karen, I love all of your tips and tricks! Thanks you so much for sharing. This is my go-to chili recipe, its absolutely gorgeous!! I add sweetcorn and kale right at the end too. Very yummy, thanks! Thank you Jasmine, I’m so happy you love it! I loved this recipe so much! I am not strictly vegan but love the idea of cutting out meat products when I can. I only did 1 tsp of chili powder instead of 2 tbsp and I thought that was a perfect amount of spice (seriously still very spicy! I think 2 tbsp would be too much…). Delicious and will definitely make again. Thanks for your review…so glad it was enjoyed! Every recipe I’ve tried is simply amazing! Thank you so much! I’m not vegan or even vegetation but love trying new foods and am trying to eat a bit healthier. My daughter has become “almost” vegetarian and I plan to make several of your recipes when she visits. Two of my favorites are your vegan chili with the cashew sour cream. So yummy! Thank you so much Dawn…I’m so happy to hear that! I made his tonight and it was very good! We ate it with vegan chili! Yum!!! My 11 year old had 2 and wanted a 3rd!! So glad to hear that Tonia! OMGosh, THANK YOU THANK YOU THANK YOU!!!!!!!!!!!!!!!!!!!!!!!!!! For two HUGE things! I follow Weight Watchers, and am not vegan. But tonight I am taking supper to a co-worker with a fractured ankle who does follow a vegan diet, so #1: I am THRILLED to have found this easy, I-don’t-need-any-crazy-ingredients-that-I’ll-never-use-again recipe to make for her! And #2: THANK YOU for a recipe that prints in BLACK! I can’t TELL you how many recipes I print for my eating plan that print in GRAY! Even though I have my printer set on black-cartridge-only, they still print in pale gray! I have to copy and paste 95% to a Word document to print so they’re black, and I can SEE them! Thank you, you made. my. day! 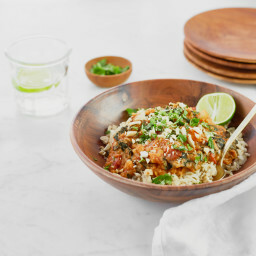 How would I do it in the slow cooker? If I use dried beans, do I only need to soak them or should I soak and cook the beans before putting in the slow cooker? Hey Andy, I think it should work in the slow cooker using pre-cooked beans (I would add them near the end of cooking). I’m not sure about using soaked uncooked beans though! Sorry about that. If using a slow cooker, I would saute the onion, garlic, and pepper on the stovetop first to ensure they get nice and soft before adding to a slow cooker. I hope this helps. :) I’d love to hear how it goes! For some reason I didn’t see you replied! I just made the chilli again! Love the recipe. Just an FYI I used soaked uncooked beans in the crock pot and it turned out great! Cooked them on low for 10 hours or so (while I was at work). Girlfriend loved it, earned some brownie points :) This recipe isn’t in the two books of yours we have. Hey Andy, So glad it worked in the crockpot using soaked beans! Great idea. I’ll have to try that. And a little brownie points never hurt anyone…lol. This sounds so delicious just like the rest of your recipes that I’m going to make it for the family tomorrow. I was wondering if it would work well with quinoa added to it. If so, how much would you think? I think you could definitely add cooked quinoa at the end, but I’m not sure about adding it at the start (uncooked). I think 1 cup cooked would be awesome. Would love to hear what you try out! This is my favourite recipe of the year! It’s phenomenal and I can’t seem to get enough of it! Adding the Frank’s hot sauce and a cup of red lentils have really added to it! Thank you for all your work, this site is my number one go to for vegan recipes! Hi Kar, I love your additions of hot sauce and red lentils..I bet the lentils give it a great texture. Thanks so much for your kind words about my recipes too! Really happy to hear how much you love them. Did you measure the amount of diced onions you used after you cut them? I measured out two cups of diced onions but it took me two onions instead of one to get there and now I’m afraid I’m going to add too much onion :/ should I just add one onion or all two cups of onions? This is seriously my go-to chili recipe! I love the heat, the flavor, the healthiness of it – everytime I make it, people rave. Thank you!! Aww thanks so much Leslie! :) So happy to hear that you’re enjoying the recipes so much. This is the best chilli recipe ever!!! the only reason I gave it 4 stars is because it is waaaay too spicy, and I love heat! The next time I put less spice and made the cashew cream and it was almost perfect! Previous post: The Bonus Recipe Bundle is here! Next post: Top 13 Vegan Desserts of 2013!